Thai noodle (kuaytiaw) dishes are always popular, the most popular Thai food noodle dishes are: Pad Thai, Khanorn jin and Pad Khii Mao. You could spend a whole week in Thailand dining on all the different styles of Thai noodles and rarely would you have to eat the same dish twice, the choices are both rich and varied and above all healthy. 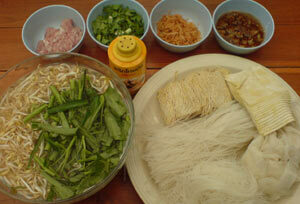 Thai Noodles come in various widths: (sen yai= wide), (sen lek= thin) and (sen mii= very thin). Noodles can be “pad”= stir fried, “haeng” = quickly doused in hot water and eaten dry or “naam” = served with a watery broth. They can be eaten with gravy (rad naa) , little balls (luk chin) of fish or meat, or “naam yaa” a fishy curry sauce. Plus a multitude of DIY toppings you should choose in addition to the standard ingredients of whatever dish you ordered. These would include, chilli powder, sugar, crushed peanuts, vinegar with finely chopped jalepino peppers, fish sauce and many more. Most tourists don’t even realise that actual name of their all-time favourite Thai food is “Kuaytiaw Pad Thai”, not merely “Pad Thai“. Nor do they know that a well-made Pad Thai recipe is neither soggy nor oily. Instead it’s a healthy blend of thin and chewy rice noodles stir fried with dried or fresh shrimp, tofu, egg, chive or spring onions (scallions) and bean sprouts, in a nutshell it’s a Thai Rice Noodles Recipe! If you find kuaytiaw naam a bit on the bland side you should add some spices or try a plate of kuaytiaw pad ki mao, literally fried noodles for a drunkard, it’s not got beer in it! Some people call it Thai drunken noodles, close, but no cigar! Made with chewy sen yai, meat or fish, plenty of fresh holy basil leaves and a lot of fresh chilli, they should be spicy enough to awaken anyone’s taste buds. Khanom jin is usually found at inexpensive restaurants and roadside stalls around the country that are dedicated to serving only this dish. The initial serving of one or two coils of the ‘Chinese pastry’ and a ladle full of spicy fish curry, or sometimes gaeng keow waan, looks insubstantial until you’ve filled your bowl with bean sprouts, pickled cabbage, fresh sweet basil leaves, and assorted other greens of your choosing. Probably the most famous noodle dish is Pad Thai which is sold nowadays for around 20 Baht but often double to “falangs” = foreigners. When I first came to Thailand I found this kind of racial discrimination quite annoying, but they are open enough to explain that it is because you are “falang” and can afford more. In their eyes this is perfectly acceptable behaviour. I should point out that this is not a common practice all over Thailand, but is mostly restricted to tourist areas, and in that regard Thailand is no different from any other country I have visited. Tourists are fair game! !